Safe Harbor’s Habitat Restoration Guide for the Outer Cape links native vegetation with specific habitats, exposures and height. 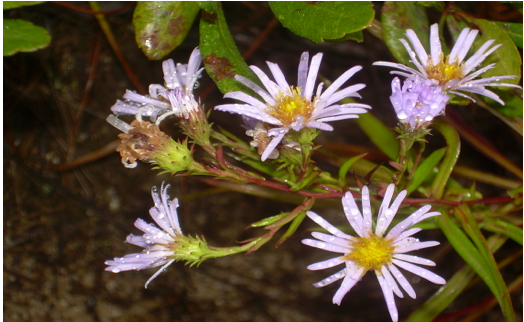 Using site-specific vegetation for habitat restoration contributes to higher survivability. This “cookbook” style booklet makes choosing plants easier, by integrating numerous, earlier versions of planting lists. We are grateful to Howard Irwin for his review of this booklet. Safe Harbor provides environmental permitting and management services for construction projects and habitat restoration projects under the jurisdiction of the Massachusetts Wetlands Protection Act; Massachusetts Endangered Species Act; Local Wetlands Bylaws and Areas of Critical Environmental Concern. The text below briefly describes soil profile preparation on restoration sites, also referred to as bioengineered revegetation systems. Successful indigenous vegetation systems contribute to restoration of habitat values for indigenous animals. Cape Cod's soil is composed of some degree of sand/clay mix. Organic material is derived mostly from microorganism decomposition of oak leaves and pine needles. Temperature and moisture cycles control the rate of decomposition. Naturally occurring acids are enhanced by indigenous bacteria and microbes that flourish in these environments. This soil composition and the low pH, acid organic environment, limit the amount of nutrients available for vegetation root systems. The pH factor may also play a role in the actual absorption process in root systems. In this relatively stable but nutrient stressed environment, specific indigenous plants have evolved and flourished. Insects, reptiles, amphibians and mammals have evolved in parallel. Environmental stresses, such as exposure to extremes of wind, temperature, moisture and salt spray, created local habitat specificity. During the past few thousand years relatively stable communities of plants and animals co-evolved, creating indigenous habitat. Any changes affecting any component of the interactive plant/animal habitat, were immediately compensated for by changes in population dynamics within the overall system. (Population dynamics study how and why populations of plants and animals change). The active interplay between these plants (seeds, fruits, leaves and roots) and animals (insects, rodents, birds and carnivores), profoundly impact each other's survival. The insect that pollinates the flowering bushes may also destroy the fruit by laying its eggs. The larvae of other insects consume the leaves. Birds nesting in the bushes will feed on these insects, preserving fruit and leaves. Rodents and birds will also feed on fruits, spreading seeds and consuming countless insect larvae before they can emerge as adults. Predatory birds and carnivores control populations of birds and rodents, reducing some impacts but creating others. Prey density is significant in predator populations. Everyone is entitled to a yard and garden. On the Outer cape, landscaped space should be balanced with indigenous space to preserve natural habitat. Indigenous animals cannot feed on non-indigenous plants. The overuse of topsoil introduces more nutrients and higher pH, which translates into more of the nutrients being available. Fertilizers create fatter, sweeter leaves, vulnerable to insects, which have the ability to chemically sense vegetation. So we turn to broad-spectrum pesticides. These impact the microorganism community, which was producing our nutrients. So we turn to fertilizers. Invasive vegetation shows up, like plants on steroids. So we turn to herbicides. These yard and garden chemicals enter the groundwater. Habitat, as we shall define it for our reconstructive use, consists of: the naturally occurring, site specific vegetation; the naturally occurring microbes reducing mulch from that vegetation to composted nutrients; the naturally occurring pH and soil type, which limits the nutrient loads; the overall, succession driven sequence of plant communities supported by those nutrients; control factors within the indigenous insect/herbivore/carnivore community. Specific interactions relevant to habitat include but are not limited to: daily or seasonal migration corridor; daily or seasonal food source; temporary or long term shelter for nesting or hibernation; reproductive areas; mating areas; prey avoidance areas. When habitats start to unravel, there may not be anything we can do to stop it. The task of habitat restoration should include reducing habitat fragmentation and increasing connected habitats. We should try to learn from past mistakes. Engineered Solutions. Indigenous habitat can't be restored without indigenous revegetation, which can't be restored without indigenous compost/mulch systems. One advantage of a Bioengineered System is that we can learn what we need to from the Earth itself. This critical information can be found in the soil horizon profile (specific depth/volume relationships between the compost and mulch layers) on indigenous, abutting sites. Assessing the composition and depth of the layers, allows us to specifically design, (or engineer) successful indigenous revegetation on site. A usually thin later of decomposed compost provides the microorganism community, already producing nutrients. The upper layer of semi-decomposed mulch should be topped with a thin, " ground litter" layer of pine needles and oak leaves when they are present on adjacent sites. These upper layers moderate thermal spiking and maintain moisture levels. Plantings and seedings should reflect adjacent indigenous habitat. Windblown indigenous seeds will be welcomed by the pH and invasives will be discouraged. Limited hand watering may be necessary, during drought, in the first four months. Watering should be done in the early morning to prevent temperature shock to the new plants. Indigenous plant communities create habitat by providing shelter and food for indigenous animals. Bioengineered revegetation systems jump-start plant succession, contributing to the restoration of habitat functions and values. Transplanting indigenous vegetation requires a slow careful dig, to secure the root mass with surrounding soil. Pre-cut burlap can be dug under the root mass with the blade of a shovel for sandy soil plants. For more stable soils, transfer the root mass onto the burlap. Burlap should be gently slid out after the root ball is in the new setting. Transplanting is most successful in the spring, to similar light and moisture exposures. Use a little indigenous compost, initially watering bi-weekly. 50% survival should be considered successful. DESCRIPTION: Leaves: wrinkled, almond shaped. Stems, covered with thin, spines. DESCRIPTION: Small deciduous shrub native to North America. Alternate leaf arrangement with compound leaves. FLOWER/FRUIT: Flowers are yellow, blooming July – September. DESCRIPTION: Tall perennial with multiple stems emerging from root. Shiny, alternate leaves with presence of tiny hairs. DESCRIPTION: Shiny, toothed leaves that are ovate in shape. Important food source for migrating birds. FLOWER /FRUIT: Flowers are white and bloom late May to early June. Clusters of round, bluish-purple berries. o Thinner flower stems compared to Seaside Goldenrod. o Found in abundant groups. · Larger berries appear on bushes in summer. Some British Soldier Lichen shown, Lichen sp. 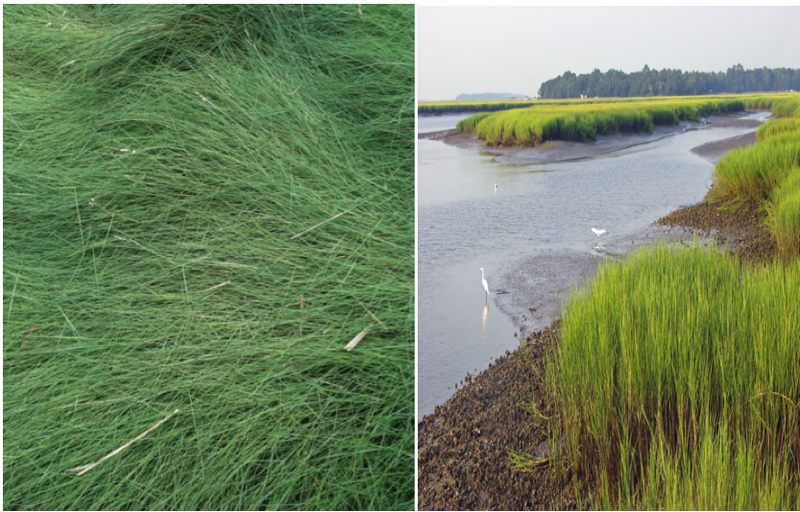 Both of these grasses are only found in salt marshes. The Cord grass needs to be flooded daily and the Hay has slightly higher elevation which only floods four times a month. The Hay used to be a valuable harvest crop for Cape farmers until the 1950’s.